Leadership 7 Edition Translated into 12 different languages and used in 89 countries, this market-leading text successfully combines an academically robust account of the major theories and models of leadership with an accessible style and practical examples that help students apply what they learn. Peter G. Northouse uses a consistent format for each chapter, allowing students to compare the various theories. Each chapter includes three case studies that provide students with practical examples of the theories discussed. 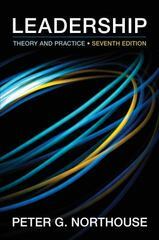 Adopted at more than 1,000 colleges, universities, and institutions worldwide, Leadership: Theory and Practice provides readers with a user-friendly account of a wide range of leadership research in a clear, concise, and interesting manner.